Reuters TV launches new version of its online video news service. New York, June 2016: Reuters, the world’s largest international multimedia news provider, has released version 2.0 of Reuters TV. 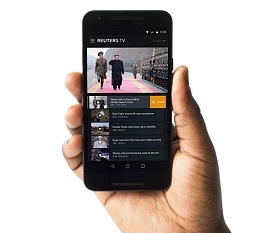 This new version of the revolutionary connected TV service introduces Featured Programs – thematic programs curated and hosted by Reuters journalists – alongside live feeds of global events and personalized video newscasts. The update includes a major redesign on both Apple TV and the Web that seeks to set the standard for premium online video delivery. Reuters TV is available for iOS and tvOS devices on the Apple App Store, Android devices via Google Play, and on the web globally at Reuters.tv. Introduced in 2015, Reuters TV is aimed at a growing segment of informed, on-the-go and globally curious consumers who value authenticity and personalization and are too busy to watch traditional TV. For these users, Reuters TV delivers a habitual new category of mid-form engagement that fits between the TV and the Web. Session frequency on Reuters TV has doubled in the past year, as session length has grown 68% and the number of active users has grown by 22 times. Editorial content from Reuters TV is produced exclusively for the service and draws upon Reuters extraordinary reach from 2,500 journalists in over 160 countries. In order to deliver the service’s variable program lengths, all content is produced in multiple versions and organized by editorial teams in London, Hong Kong, New York and Washington DC, providing 24/7 coverage for viewers.